This post was first published on September 2, 2015. September 2, 1945 marked the official surrender of the Japanese. Below, you can listen to President Truman address the U.S. and watch the ceremony in color. Try playing them at the same time for an interesting background to the surrender proceedings. On August 19th, the men on Ie Shima witnessed history in the making, as at 12:30 p.m. two white Jap Bettys approached the island escorted by hordes of P-38s, 2 PBYs, two B-25s and other elements of our efficacious air force. After making two trips around the island, the Bettys landed gracefully on Mocha strip which was lined up with M.P.s and thousands of curious soldiers. As the ships taxied down the runway, their bespectacled engineers stood half out of their open top hatches. They were bedecked in most elaborate flying attire—leather jackets, flying helmets, and goggles. One couldn’t help but think how uncomfortably warm they must have been, because the afternoon was torrid. The contrast of these Japanese flying personnel to our airmen who usually wear nothing more than a T-shirt and sun-tan pants, was certainly sharp, but on this particular day, the little guys were perhaps salvaging the last remnants of that imperialistic pride so completely stifled by their defeat. Upon reaching the end of the runway, the planes did an about-face and taxied to the other end of the runway as hundreds of soldiers with cameras made a mad dash in that direction. At this end of the strip were parked two C-54s, resplendent in the afternoon sun. These were to take the Japanese emissaries to Manila. Not much time was wasted, and within 15 minutes the emissaries with their entourage boarded one of the giant cargo planes and were off to General MacArthur’s headquarters. We also went digging around YouTube and found part of a newsreel from that day’s events. Want to read more about this point in history? Check out The 345th’s Final Show. After Japan surrendered on August 15, 1945, General MacArthur set to arranging the formal surrender and occupation of Japan. A delegation was to meet with U.S. officials at Manila, and bring all their defense plans to stave off potential Japanese resistance. This would take place a week later. The delegation was ordered to fly to Ie Shima in airplanes that had been painted white with giant green crosses. 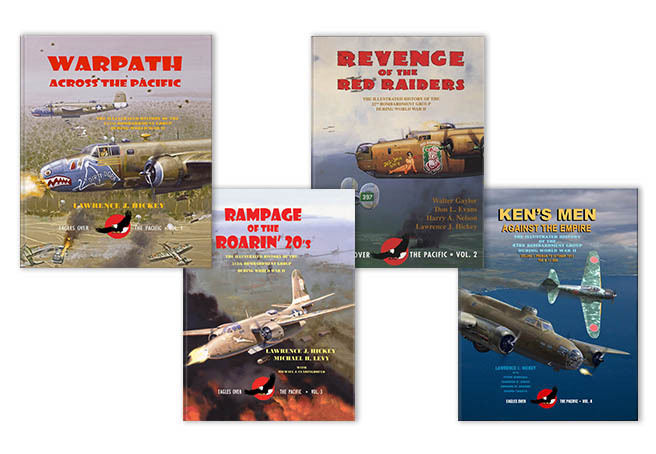 They would be accompanied to Ie Shima by a bomb group chosen by MacArthur: the 345th. 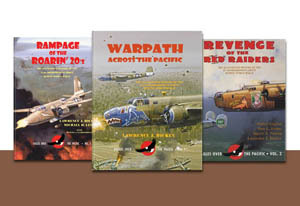 A total of six B-25s and twelve P-38s met the two white-painted Mitsubishi G4M “Betty” bombers, although, with the cloud cover, it wasn’t easy to find the planes at the rendezvous point. A Betty bomber lands at Ie Shima with Japanese delegates aboard to discuss the surrender with Allied officials. 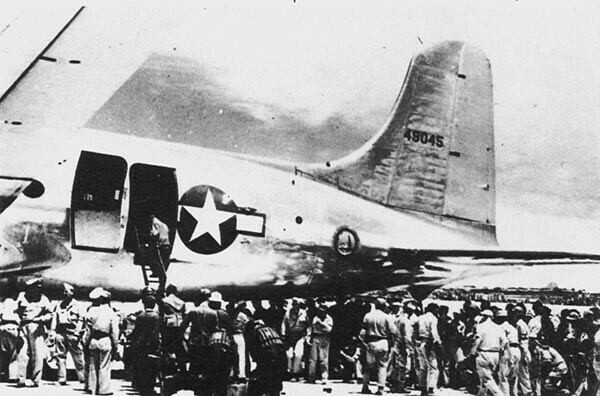 Japanese delegates climbing into a C-54 that would take them to Manila. A large crowd was watching the planes land. One of the Japanese pilots was so unnerved that he forgot to put down the flaps as he came down, leading to his plane bouncing on the runway. 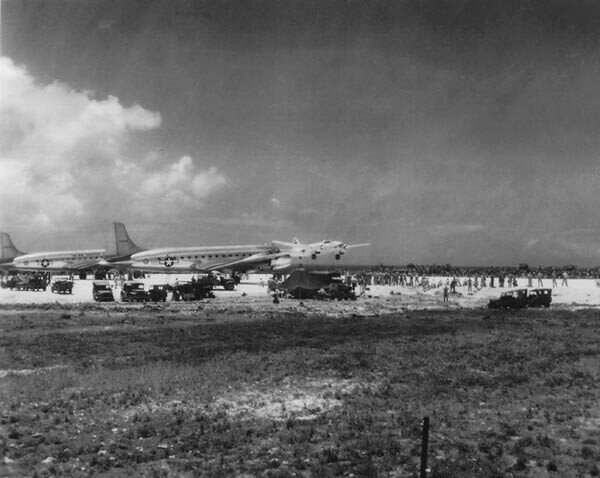 The Japanese delegation got out of the Bettys and were shown to the C-54 that would take them to Manila. In order to humiliate the Japanese, they made the delegation board the plane via a painter’s ladder at the back of the plane. A Betty bomber being escorted by BETTY’S DREAM of the 499th Bomb Squadron on August 21, 1945 after the surrender delegation met with Allied officials at Manila. On the 20th, the Japanese returned to Ie Shima, where they would be escorted back to Japan by the 345th again. As one of the Bettys was taxiing, there was a minor wheel mishap, which put the plane out of commission for the day. The delegation was split up, with five men staying in Ie Shima overnight, while the rest of them boarded the other Betty bomber and were escorted back to Japan. Oddly, that Betty ran out of fuel near Honshu and required a water landing. The men aboard got out in knee-deep water, waded to shore and caught a plane back to Tokyo. The part of the delegation stuck in Ie Shima was able to return to Japan the following morning without issue.